Qualified & Accredited Obedience Trainer, Behaviour Consultant & Law Enforcement dog Trainer. This is a behaviour, pack structure and obedience program that takes nearly no time from your day. I created this program after many years of working with dogs. This is the basic/generic version of the program, I modify it with the same basic technique to solve problems and go into advanced learning. It’s remarkably effective for gaining control with no force. I have used it with dogs for many years that have been trained to engage a man in combat and would not hesitate to attack me if it were not for this program. I have also used it to rehab extremely fearful dogs that would otherwise not even look at me. The bases of this program is to have the dog look to you for guidance and permission to partake in anything you say that the dog can, including food, toys, game etc. Our goal is to have the dog engage self control out of respect for you. 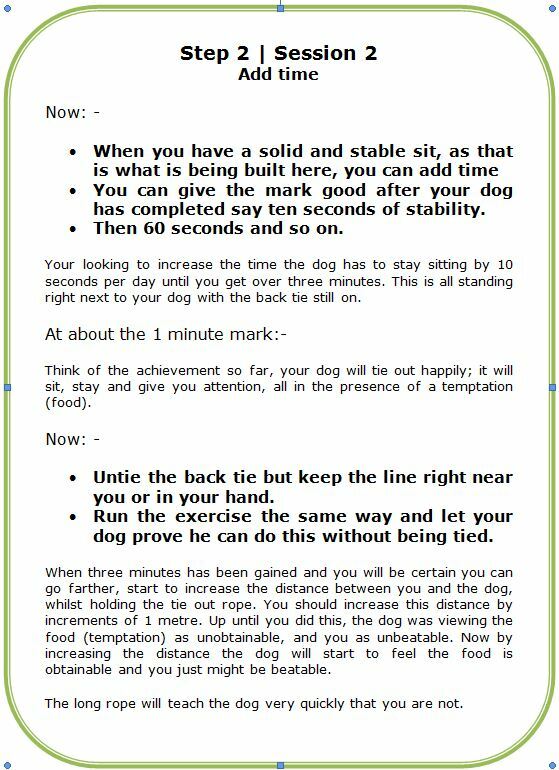 This teaches the dog to control its drive and strengthen its mind. 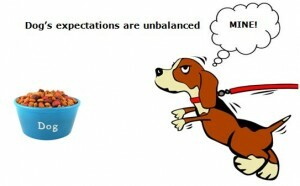 We need to convert the dogs expectations to meet reality, not raise a dog without respect. 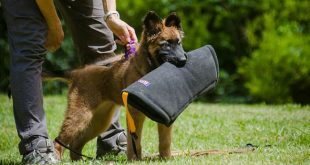 To begin the program we must follow basic training principles, this means start the training with no other distractions around, no dogs people etc. 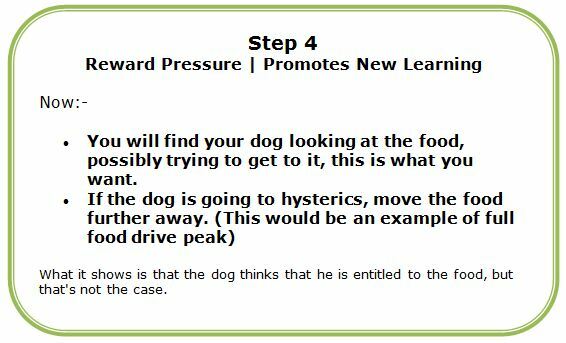 The key to starting is to have a food driven dog, if you don’t have a dog with a high food drive, miss the meal before you start or at least reduce it by ¾. Fasting is healthy for dogs. 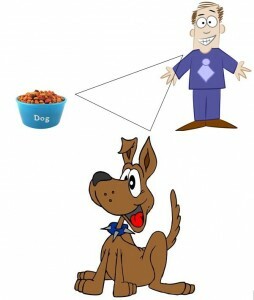 Now you have a dog that wants the food, this means the dog will have drive for the food. This is a training IN drive program. 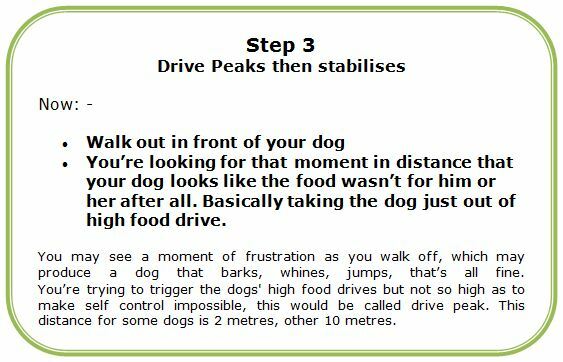 Training in drive uses the drive concept that “drive is a subconscious reaction to stimuli“, this program works fast on any dog. 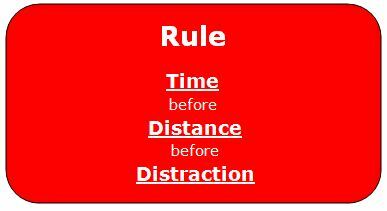 This takes the immediate pressure off the dog and allows handler to understand how to leverage distractions. You will be back tying your dog with a flat buckle collar (non correctional collar) or harness and long line to something solid in your yard. Make sure all other dogs are out of site, we are looking for as low a distraction as possible. Learning is best done under no distraction; we are trying to trigger food drive, not possessiveness, so no other animals. 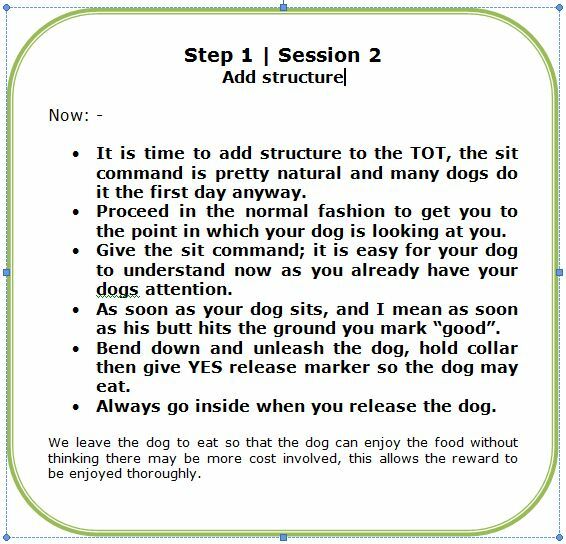 Prepare the meal inside, your dog will learn, through positive results in this program that being tied out will end in drive satisfaction ie: Positive reinforcement. This is good if you have a dog that whines on a tie out. 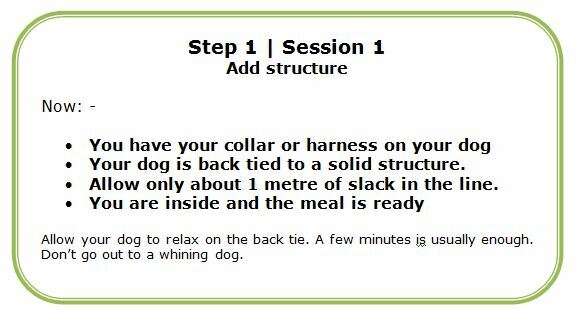 At the end of the program you will have a list of things, such as being tied out, long sit stays etc that are all thought of as positive to your dog. When you find yourself able to wander inside while the food bowl sits there UN touched by the dog, you’re ready to add distraction. Allow a second dog now to eat from its own bowl perhaps, remain out of site for a period of time, and change the environment to outside the front gate perhaps. These are just some ways to add distraction. Build reliability into your dog by working it. When you’re at this level you will have a dog that looks to you to make the big decisions, like when he can have his treasure. Feel free to substitute the food for another treasure, such as a treat, ball, toy or an open back door or front gate. The key is that this gives you control of all the treasures in life, each repetition is positively rewarded at the end by allowing the dog the treasure, when you say he can have it. This is the generic version of this program, we modify this program many ways to suit different applications, from nervy stressful dogs to rank aggressive dogs to high level competitors. We can tailor this program to suit all applications. Take a look at Raja in WA who is at the no tie back stage! This article is copyright protected (2002) © and can not be used or distributed without K9 Pro consent. You are, however, allowed to distribute this link to direct people to this site. None of the graphics appear on this page (using Google Chrome). Is there something wrong? I have another question – at what age should you commence this training? You can start this with a pup at 8 weeks, or any age dog, start any time! I’m having same problem with graphics now. Is it a Chrome issue? No our IT is working on it. Most trainers use “Yes” as a marker word and “Free” as a release word. In Step 6 you use “Good” as a marker and “Yes” as a release word. This could be confusing considering the majority preferred use. Any chance you could update? Hey Andy and thanks for your input, the words themselves are meaningless to the dog until you place reward around them. So if you feel better using yes and free by all means do so. One consideration I made when writing this program some years go now was that many people have poisoned these words through poor training and or punishment, so in those cases better to start fresh. 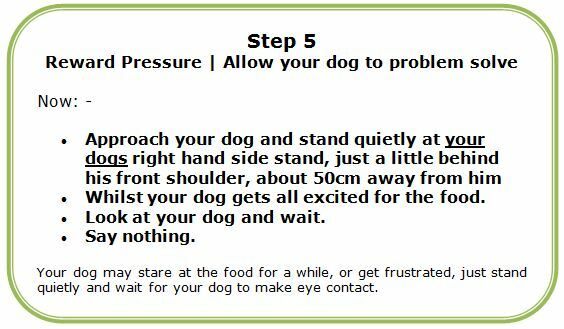 I tried this today with my bossy little dog, I got to step 4/5 standing at his shoulder waiting for eye contact and he started freaking out – whining shaking and moving around on the leash. Is this the high food drive you spoke of? It probably is, just repeat again tonight and I am sure he will settle into it. Hi guys, can’t see any of the graphics on this page. Im about to teach the 3rd pup TOT, since first beginning with our first GSD. Love it. If the dog is going IPO route, can you share/explain, how TOT gets modified? For a pup or dog? 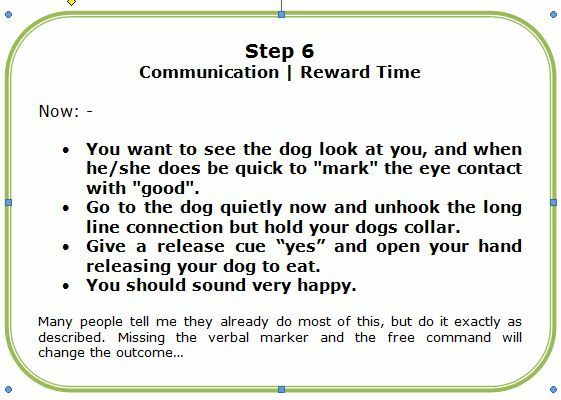 At the start it teaches impulse control, markers and to focus on the handler in the presence (distraction) of, reward. Once pup will sit with eye contact you can step into heel position and markl that, then call to heel position and mark that. Can be used for the recall, front or any position. brilliant! I cant wait to get going. Having to wait for new pup right now. 7 weeks to go! I love this new upgraded look of the TOT Attachment. I have one that’s 9yrs old. black n white typed. Done! And it worked out well for me and Bernie GSD, and 2 other dogs since. Thanks heaps!